Plot. Income: 3. Initiative: 8. Claim: 1. Reserve: 6. Plot deck limit: 2. 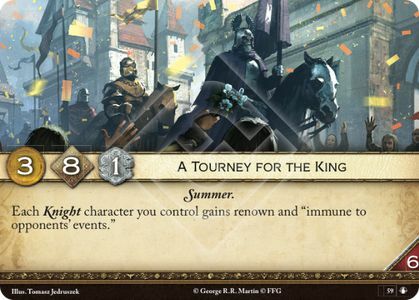 Each Knight character you control gains renown and "immune to opponents' events." "For the purpose of determining whether or not a card is immune to a delayed effect, the delayed effect is considered to be an effect of the card and card type that created it." (FAQ 2.2). Therefore, the poison token kill from Tears is an event effect, and Knight characters are immune while A Tourney for the KIng is revealed.